Chicken under a brick? Been there. Steak on a shovel? Done that. Beer can chicken? Please. So this week, I’m starting a series of blogs on extreme grilling. 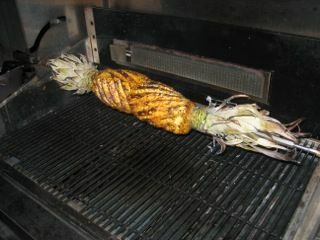 First up, using a military strength blowtorch to caramelize spit-roasted pineapple. The device pictured above is an industrial-strength blowtorch used for roofing and “search and destroy” landscaping. One popular model is the 100,000 BTU Red Dragon–you can find it at www.amazon.com–which runs off a propane tank. That’s right–the sort that fires your gas grill. The pineapples have been crusted with cinnamon sugar and caramelized candy crisp. 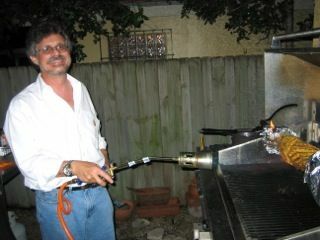 So how else can a blowtorch help you become a better griller? 1. Use it for lighting charcoal–no need to resort to using lighter fluid. 2. Sprinkle Catalan creams, creme brulees, and even sliced bananas with sugar, then use your blowtorch to melt it into a hardened candy shell. 3. At the restaurant O-Ya in Boston, they use a blowtorch on sushi to coax the fish’s flavorful oils to the surface. And at a sushi bar in Santa Monica I saw an innovative chef lay a sushi-grade slab of albacore tuna on a cypress plank and kiss it with the focused flame of a blowtorch. The latter was then served with a ginger sauce.